This is a guest post by Dr. Jon-Patrik Pedersen. Dr. Pedersen is a clinical psychologist in California and a member of the Secular Therapy Project. Learn more about Dr. Pedersen at his website. In seven states, laws exist to ban nonbelievers from holding public office, even though the Supreme Court deemed this unconstitutional in 1961. In a 2009 Newsweek poll, 26% of responders reported that atheists are ”inherently immoral.” In a 2006 University of Michigan study, Americans rated atheists below Muslims, recent immigrants, gays and lesbians, and other minority groups in “sharing their vision of American society.” Atheists were also the minority group that “most Americans are least willing to allow their children to marry.” This study observed that “atheists … offer a glaring exception to the rule of increasing social tolerance over the last 30 years.” Currently, TheFreeDictionary.com gives these synonyms for atheist: nonbelieving, sceptic, disbelieving, faithless, heathen, infidel, godless, irreligious, unbelieving, freethinking, paganistic, and that pesky nullifidian. In psychology’s mission to best serve diverse populations by incorporating multicultural education and research, those who identify themselves as atheist or agnostic have received little attention. While in the last decade passionate and sometimes strident nonbelievers have become more visible in the media, cultural attitudes toward atheists have remained quite negative, as can be seen in the statistics above. Likely because of this, the clinical dynamics regarding atheists as clients have been overlooked, if not disregarded. Whereas a client’s religious beliefs were generally excluded from treatment, or were interpreted as regressive, during modern psychotherapy’s birth in Europe, a client’s spirituality or religious beliefs (as well as those of the psychotherapist) are now generally considered an important part of treatment. Thus, ironically, the tables have turned to a significant degree. It is now the case that most psychotherapists would not want to be identified as atheist, many for fear of losing potential clients and referrals. The term atheist (Greek for without deity) can simply mean that one does not believe a god or gods exist. This position is referred to as weak atheism. Some atheists go further and assert that no god can exist, which is referred to as strong atheism. Either way, the term atheisthas taken on such a pejorative meaning that many atheists choose to refer to themselves as agnostic (“I don’t know if a god or gods exist”), secular, or nonreligious. In the U.S., these groups together were estimated to be approximately 9% of the population only a decade ago, but new data shows this to be the largest growing demographic group in the US. Recent work even shows that as many people identify as non-religious as now do Catholic or Evangelical Christian. However, this does not mean that all atheists have disowned the idea of spirituality for themselves. As states Andre Comte-Sponville (The Little Book of Atheist Spirituality, 2006): “People can do without religion…but they cannot do without communion, fidelity and love. Nor can they do without spirituality.” The renowned biologist Ursula Goodenough writes of her experience of Mystery in The Sacred Depths of Nature (1998), and psychologist Kirk J. Schneider describes his understanding of spirituality in his Existential work, Rediscovery of Awe (2004), to name just a few who write on this topic. People come to an atheistic perspective by various paths that can be generally grouped into three categories: Philosophical, Scientific, and Reactive. The Philosophical Path is comprised of those seeking to understand the meaning and value of existence. The Scientific Path is informed by a specific way of understanding the natural world, and it is interesting to note here that a total of 93% of those responding to a 1998 survey of the National Academy of Sciences represented themselves as either having a “personal disbelief in a god or gods” (72.2%) or as Doubtful or Agnostic (20.8%). The Reactive path, which is comprised of those who have felt traumatized by a religious organization or representative, is particularly relevant to psychotherapy. When considering treatment, these prospective clients are often quite concerned and sometimes vigilant about the possible religious orientation of their psychotherapist. In response to how real and prevalent this situation is, psychologist Dr. Darrel Ray developed The Secular Psychotherapist Project (seculartherapy.org), a national registry dedicated to providing “a psychotherapist that will use proven, state-of-the-art therapeutic methods that do not involve supernatural or religious elements.” Currently, 385 psychotherapists are available and over 14,000 prospective clients have signed up. Obviously, this shows demands far outpacing supply. We as psychotherapists must also be as aware as possible of our biases and how much of the predominant values of our culture we carry with us. Since these are decidedly critical of non-believers, and pervasive, it is necessary that we reflect on how an atheist client might affect us. Are we uncomfortable or perplexed about how to respond, or invested in leading this person to a more spiritual experience of life? Or might we associate atheism with cynicism, amorality, hopelessness, or arrogance? End of life situations and instances of severe or chronic suffering are times when it can be particularly difficult not to introduce our beliefs into treatment. As professionals devoted to reducing suffering, and simply as fellow humans who want to provide comfort, how do we address these most profound times while respecting our clients’ own value systems and wishes? As much as we might believe that death is not the end, how do we honor a client who believes it is, and wants to face this finality existentially. These are not easy questions or easy times, and it is facile to think there is one answer to address all situations, but for atheist clients, what not to do is clear. As mentioned earlier, the segment of the population who identifies as non-religious has grown immensely in the past two decades, which means that more and more people with this view on religion will be seen in various mental health contexts. 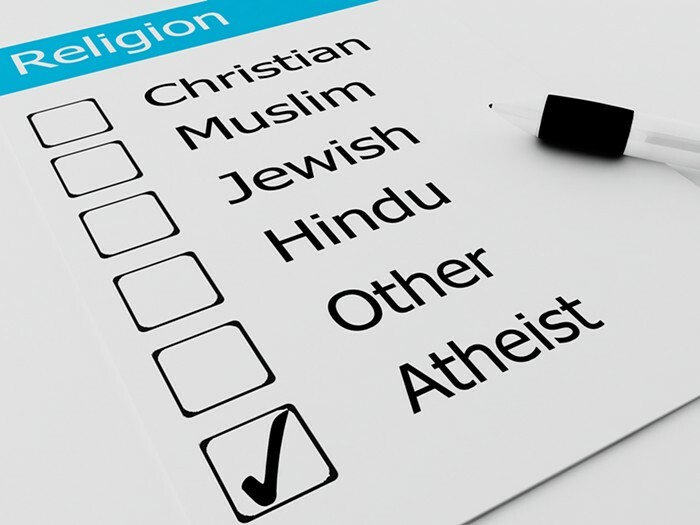 And while the number who explicitly identify as “atheist” may be small, considering that many non-believers avoid the term atheist and others are reconsidering their beliefs, it is inevitable that we will be greeting atheist clients in our waiting rooms more and more. It is my hope that the information presented in this post can help make that interaction more informed, more conscious, and more beneficial.